Of course since it was made, airgunsmiths have found it to be an excellent platform for customization. 1100s have been converted to bulk fill and re-valved to increase power. Changing the valve spring or making a new, lighter, valve would increase opening time and the the volume of gas released. The guns can also, with no conversion, fire a .375″ lead ball over a couple of wads. One owner, writing in (I think) the now-defunct Airgun News, claimed 100 ft-lbs of muzzle energy for his conversion. A more realistic power level of 42 ft-lbs (465fps with an 80gr ball) is claimed at this web site. Whatever the capabilities, the 1000 was one of the best made, best looking guns Crosman ever produced, with a solid heft that put you in mind of a medium caliber firearm. I owned two at various times, back when you could buy one for $70-80. These days a good example can command as much as $300, and a complete set with trap, shells, and reloading kit can go as high as $500. David Bartle very helpfully added these shell dimensions in the comments. I thought enough people would find them useful that I’ve copied them here. This was written by mje. Posted on Monday, June 9, 2008, at 5:58 pm. Filed under History, Technology. Bookmark the permalink. Follow comments here with the RSS feed. Post a comment or leave a trackback. I have a Trap Master 1100 and 1 box of Crosman shells for it that I am willing to sell for $250.00 shipped to you. 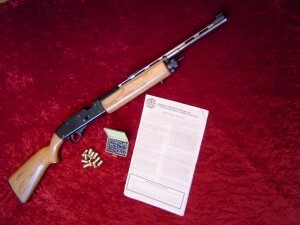 the gun is in very good condition, I will send you pictures to a phone or email. The shells are out there on eBay and elsewhere. For wads, just use a piece of heavy cardboard. I have owned 2 Trapmaster 1100’s for almost 50 years. My mom worked for Crosmans and bought them for my brother and me. I’d like to sell them. I have some shells too. I have a like new Trapmaster 1100 with the complete trap & targets and 12 boxes of shells for sale if any interested parties. I came across this site researching a trapmaster that has been in my gun case for years. I have never used it and would be interested in selling it. I also have 2 boxes of targets, 8 boxes of shells and a box of 60 CO2 cartridges. I have a Trap Master 1100 for sale. It’s in OK condition but could use a good cleaning. If you are interested email me and I’ll send you some pictures. It was given to and I’m not looking to rich off it I would just like it to go to someone who will appreciate it. If anyone who posted they had a trap master for sale still has one available send me an email jeffdevisser@gmail .com I would like to purchase one. Looking for Ammo for trap master 1100. If anyone has the dimensions of the shot shell, it would be greatly appreciated. I have a Crossmen 1100 and some shells that I reload with 3/8 stainless ball bearings. It has lost its air seal, is this fixable? What size o rings will I need ? A kit maybe? I will post again after I disassemble….. thanks for any responses. Maybe if it was in the original box with all the paperwork and accessories, including the trap thrower. But people still buy these as shooters, not pure collectibles. 2. Model 766 BB REPEATER/ .177 PELL— SER.#377454077. Warren do you still have the Trap master available? ‹ What’s in a Name?